The fighting took place in Mohmand, one of Pakistan's so-called tribal districts that form a buffer zone between the two countries. (AP file photo for representation only) Pakistan army soldiers The fighting took place in Mohmand, one of Pakistan's so-called tribal districts that form a buffer zone between the two countries. 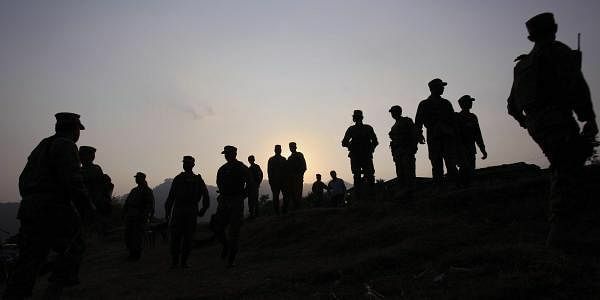 ISLAMABAD: Five Pakistani soldiers and 10 militants were killed in a coordinated overnight raid at several border posts on the frontier with Afghanistan, the military said Monday. The fighting took place in Mohmand, one of Pakistan's so-called tribal districts that form a buffer zone between the two countries, where the military has been battling Islamist militants for over a decade. Pakistan's military issued a brief statement providing casualty figures, without mentioning which militant group was involved. "Effective presence, vigilance and response repulsed (the) terrorists' attempt," it said. Army chief General Qamar Javed Bajwa "hailed the sacrifices" of the Pakistan soldiers and called for greater numbers to man the border, according to the statement. The toll could not be immediately verified since the area is remote and journalists are denied access. The raid came at a time of heightened tension between the two countries, with Islamabad blaming Kabul for a recent spate of militant assaults that killed 130 people in February, after a relatively long lull in violence. Afghanistan for its part accuses Pakistan of fanning the flames of an insurgency that has gripped its country since the Taliban were ousted from power in 2001. Pakistan's foreign ministry later summoned the deputy head of the Afghan embassy in Islamabad to lodge a "strong protest". "The Afghan government was urged to thoroughly investigate the incidents and take firm action against the terrorists operating from its soil," the ministry said in a statement.